Above, Lee Atwater, famously ruthless political strategist for Ronald Reagan and the elder George Bush. He perfectly encapsulates the “Southern Strategy” – a 50 year campaign by the Republican Party to take advantage of white resentment, enflamed by the civil rights and voting rights movement, – mainly in the south, but effective among whites everywhere – to draw support to the GOP. Effectively, the effort has been to weaponize the lowest and worst drives of humanity – Atwater et al hoped, to gain power for their clients. We see the results today. Perhaps its less surprising now to see who Atwater was in business with. Legally, there are two firms. Black, Manafort, Stone & Kelly, a lobbying operation, represents Bethlehem Steel, the Tobacco Institute, Herbalife, Angolan “Freedom Fighter” Jonas Savimbi and the governments of the Bahamas and the Philippines. Black, Manafort, Stone & Atwater, a political-consulting firm, has helped elect such powerful Republican politicians as Senator Phil Gramm of Texas and Senate Agriculture Committee Chairman Jesse Helms. The political credentials of the partners are imposing. Charles Black, 38, was a top aide to Senator Robert Dole and the senior strategist for President Reagan’s re-election campaign in 1984. Paul Manafort, 36, was the political director of the 1984 G.O.P. national convention. 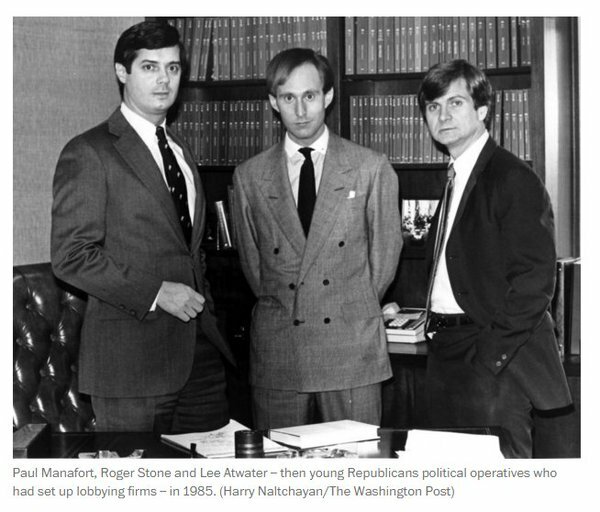 Roger Stone, 33, was the Eastern regional campaign director for Reagan in 1984 and is now one of Congressman Jack Kemp’s chief political advisers. Peter Kelly, 48, was finance chairman of the Democratic National Committee from 1981 to 1985. Lee Atwater, 34, was Reagan’s deputy campaign manager in 1984 and is now Vice President George Bush’s chief political adviser. Alone among the firm’s partners, Atwater sticks to advising electoral candidates and does not lobby. change is examined. Public opinion data from Pew and American National Election Studies surveys are used to show that racial identification and prejudices are increasingly correlated with opinions about climate change during the Obama presidency. Results show that racial identification became a significant predictor of climate change concern following Obama’s election in 2008, and that high levels of racial resentment are strongly correlated with reduced agreement with the scientific consensus on climate change. These results offer evidence for an effect termed the spillover of racialization. This helps further explain why the public remains so polarized on climate change, given the extent to which racial grievances and identities have become entangled with elite communication about climate change and its related policies today. The figure (above) shows the average level of racial resentment among white respondents over time, from 1988 to 2016. A score of 0 reflects the lowest possible level of racial resentment, and a score of 1 reflects the highest. What began as a way of trolling Prius drivers became a signature protest against America’s first black president — rolling coal. Drivers spend hundreds or thousands of dollars retrofitting their trucks so they can blanket cyclists, motorists and pedestrians with thick, black clouds of exhaust. “I run into a lot of people that really don’t like Obama at all,” one seller of coal-rolling equipment toldSlate. “If he’s into the environment, if he’s into this or that, we’re not. I hear a lot of that.” In some instances, the practice has taken on an explicitly racial tone, as drivers publish videos of themselves rollingcoalon Black Lives Matters protestors. WASHINGTON — Since Donald J. Trump began dominating American politics more than two years ago, Democrats concerned about his policies and behavior have taken solace in a group of influential Republicans who have consistently assailed the president as anathema to the values of their party, and the country more broadly. While a slew of initiatives raised big money for cross-partisan bridge-building and even presidential campaigns in 2012, the current effort is different. It involves more players who are more actively involved in politics from across the spectrum, many of whom bring their own constituencies, making it less centralized and, in some ways, less organized. Yet they are arguably more united than past efforts by their concern over threats to democracy they contend are embodied by a single politician: Mr. Trump. It’s an amorphous, somewhat secretive effort, partly because some participants fear Mr. Trump and his allies would brand Never Trump Republicans as pawns of Democrats. Meeting locations, agendas and attendees are mostly kept quiet, while political intelligence is privately shared between participants on opposite sides of the political spectrum. But some of the collaboration is becoming more overt. Over the last couple of months, network members filed amicus briefs accusing Mr. Trump of overstepping his authority on matters ranging from immigration to his administration’s efforts to block a mergerbetween AT&T and Time Warner. And last month, the Senate Judiciary Committee passed a bill to protect the special counsel investigating Russian meddling in the 2016 election, for which network members had lobbied. What Does Serious Policy Looks like On Climate? I inform people that other states or countries are adopting some pretty aggressive renewable and efficiency standards. The latest round of standards, which take effect in 2020, do enable some pretty groundbreaking developments in the advancement of clean energy. Besides the requirement that all new homes under three stories install solar panels — a first for the nation — the codes help to incentivize energy storage and include a host of energy efficiency upgrades that will collectively slash energy use in new homes by more than 50 percent. A new law recently passed in France mandates that all new buildings that are built in commercial zones must be partially covered in either plants or solar panels. Green roofs are already very popular in Germany and Australia, as well as Canada’s city of Toronto, where a similar law has been in force since 2009. Planting the rooftops of urbanized areas brings many benefits to public, private, economic and social sectors, as well as to the local and global environments. Here are the top 5 reasons to chose a green roof. 1. Green roofs reduce stormwater runoff. Green roofs increase water retention and can reduce water run-off by 50–90 %. Stormwater that leaves the roof is therefore delayed and reduced in volumes. Outlets, pipes and drains can thus be reduced in capacity, thereby saving construction costs. Finally, retention and delay of runoff eases stress on stormwater infrastructure and sewers. 2. Green roofs are energy efficient. In summer, the green roof protects the building from direct solar heat, while in winter it minimizes heat loss thanks to its added insulation. Energy conservation translates into fewer greenhouse gas emissions. Green roofs also improve air quality, as plants leave trap dust particles from the air, and evapotranspiration cools ambient temperatures. 3. Green roofs can serve as habitat. Low maintenance green roofs can be designed to serve as refuge for species such as ground-nesting birds. Vegetated rooftop habitats can also serve as stepping stones, to create corridors connecting other patches (roofscape or at grade) across an urban sea to natural habitats beyond the city. 4. Green roofs last longer. Green roofs cover the waterproofing membrane, protecting it from UV rays and extreme daily temperature fluctuations. This protection extends the lifespan of the waterproofing twice as long as conventional roofing, meaning that membranes under green roofs last twice as long as those on traditional roofs. This is a great series, glad to see its been discovered. Closer look at a little known episode of earth deep-time history. Caution: requires belief in science. The most reliable information about ice mass balance has been coming from the Gravity Recovery and Environment Experiment (GRACE) satellites for the last decade. But that pair of satellites was reaching the end of its useful life, and scientists have been anxiously awaiting launch of the important GRACE FO (Follow On). Successfully launched, will start sending useful data in 90 days. Today, NASA successfully launched a pair of satellites collectively known as GRACE-FO (Gravity Recovery and Climate Experiment Follow-On mission) as a replacement for the two GRACE satellites currently in orbit. Launched in 2002, GRACE helped provide a better understanding of many of Earth’s most pressing conditions, including rising sea levels, melting ice sheets and droughts. But last year, after 15 years of service, the original GRACE duo completed its mission. The new satellites will continue GRACE’s work, but feature updated tech, including improved batteries and an extra camera. The pair will map out changes in Earth’s gravitational field, which scientists use to monitor distribution of water on the planet’s surface. And as NPR’s Christopher Joyce notes, they might even help in earthquake prediction. As Joyce explains, the Earth’s gravitational field changes with our planet’s mass. It’s stronger over areas with lots of mass, like mountains or bodies of water, and weaker where there’s less mass. As Alessandra Potenza writes for The Verge, to observe these tiny variations, the pair of car-sized spacecraft will zip around Earth—one trailing roughly 137 miles after the other. According to NASA, the pair will use super-sensitive “microwave ranging instruments” to continually monitor the distance between them. By measuring minute changes in this gap, they can track differences in the tug of Earth’s gravity over the planet’s many features. By measuring these changes month after month, the satellites can monitor long term shifts of water resources on the ground—glaciers growing or shrinking, shifts in underground water storage, snow melt in the spring. ”[T]hat shift of water leaves an imprint on the gravity field, and that’s what we detect and what we’re after,” NASA Jet Propulsion Laboratory geophysicist Felix Landerer tells Joyce. Practice using this phrase in a sentence. A Perennial climate denier distortion is to claim that Electric vehicles do not run cleaner, because they are charged from a dirty grid (which deniers want to keep dirty). Truth: Even charging on a coal-dominated grid, EVs are so efficient, that they are a gain for most drivers, in every state (unless you only rode a motor scooter before..). AND, the grid keeps getting cleaner as more renewable energy comes on board. It’s never been better than today, as electric cars are now cleaner than the average new gasoline car everywhere in the country – the report states – even where plug-ins are recharged from the dirtiest coal-dominated electric grid. “The analysis, which looked at the latest data on power plant emissions, revealed the average electric vehicle on the road today emits so little in the way of global warming pollution that it’s like driving a conventional car that gets 80 miles to the gallon. The gap between gasoline vehicles and electric vehicles has grown over time. In 2012, only 45 percent of Americans lived in parts of the country where driving electric produced lower emissions than driving a 50 mile per gallon (mpg) car would. Today, 75 percent of Americans get their electricity from regional grids this clean. Electric vehicles will continue to get even cleaner as more coal-fired power plants close in favor of wind and solar power, whose prices continue to drop. Coal already has fallen from providing 50 percent of the power on the grid to 30 percent. Renewables now provide 10 percent of America’s electricity. Below, Stanford lecturer Tony Seba is extravagantly optimistic about EVs in this 2016 talk. Nothing that’s happened since makes him look wrong – quite the opposite.